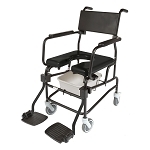 The multiCHAIR 3000 is a multi-purpose bath chair with various uses. Weighing only 14 lbs, this chair is portable and lightweight. 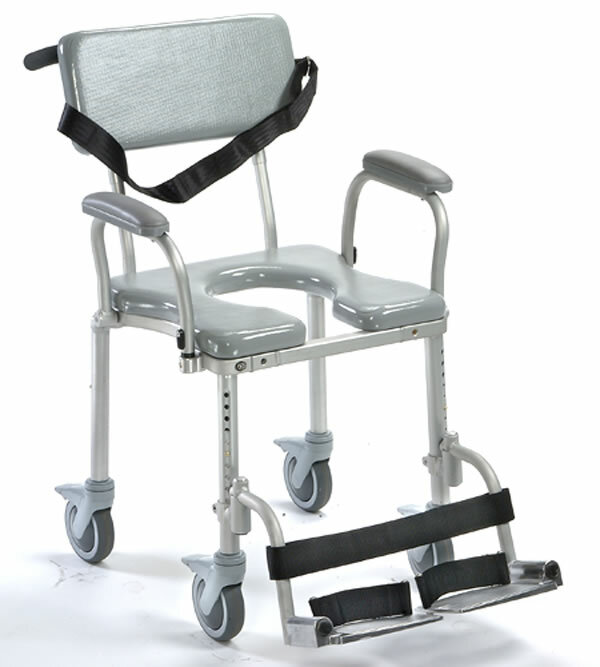 Versatile, the multiCHAIR can be used as an adjustable height raised toilet seat, shower chair, or tub transfer bench (with purchase of optional transfer cushion kit). 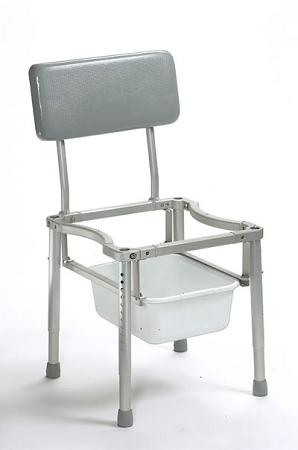 Well engineered, strong, and built to last; you may never need to purchase another tub/toilet chair. 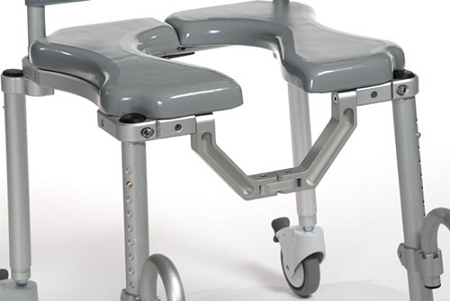 Additional features include self-skinning padded urethane back and seat cushion, cantilever fold-back/locking padded chair arms or swing-away locking arms, and 300 lb weight capacity. 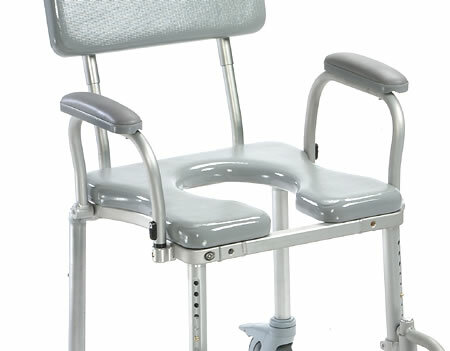 Constructed of aircraft grade aluminum, brass, stainless steel, and durable plastics this chair will not rust or corrode. 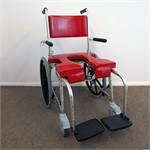 Seat Cushion: 17" x 17"
Back Cushion: 17" x 8"
Arm Pads, Pair: 9” long. Attaches to swing-away arm. 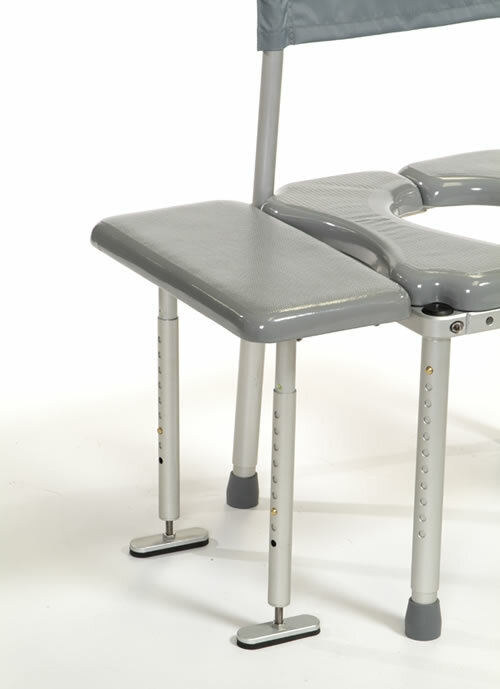 Drop Rail and Frame: Allows 4” of clear front or side access without the cushion or frame getting in the way. Specify Orientation: left, right, front, or back. Transfer Cushion Kit - 8" Wide: Swing-away style. For use with Cantilever side arms only. Can be used on left or right side of chair. 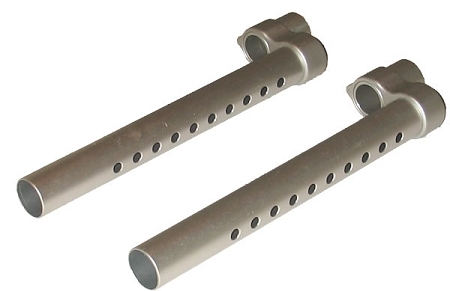 Shower Legs, Pair: For use with 8" wide transfer cushion kits. Add these legs to the transfer cushion kit for use in a shower. 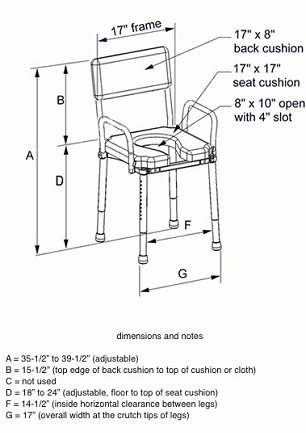 Transfer Cushion Kit - 12" Wide: Includes (2) full length legs. For use at a tub or shower. 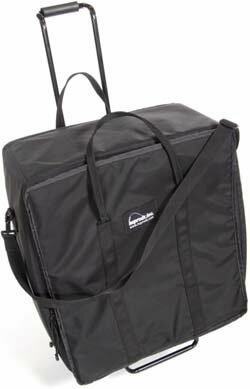 Carrying Case: 18” x 18” x 6” with two black nylon, heavy duty zippers, two handles, and removable shoulder strap. 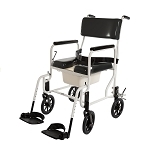 Luggage Dolly: Folding luggage dolly can be used with carrying case. 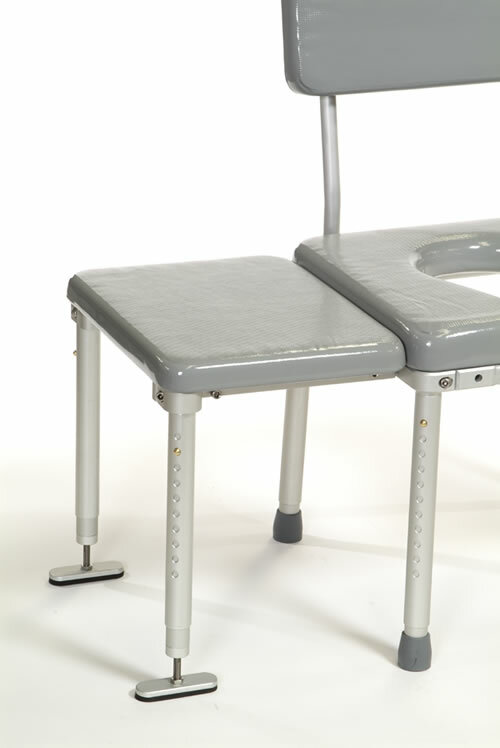 Commode Pan: Includes 12” x 14” x 6” pan, aluminum u-channel rails, and stainless mounting hardware. Commode Pan Lowering Brackets, 4: For use with commode pan. Mounting hardware lowers pan 4” to provide access between frame and pan. 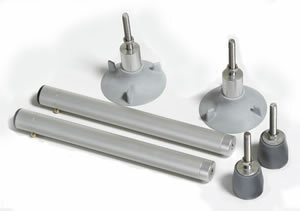 Vertical Suction Cups, Pair: Clamps onto the outside of the legs and attaches to the vertical face of tub or wall. Suction Cups: Includes a pair of inner legs. Suction Cup/Crutch Tip Combo: Includes both suction cups and crutch tips with threaded stems to attach to a pair of inner legs. 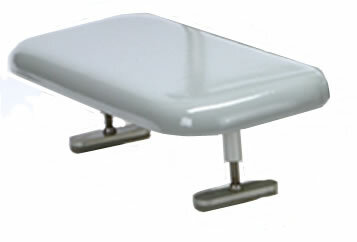 2" Thick Square Shaped Cushion: Seamless padded self-skinning urethane cushion comes standard with chair. 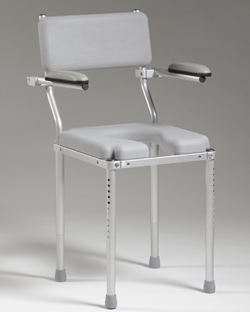 1 1/2" Thick Solid Cushion: Seamless padded Ensolite TM cushion (no commode opening). 1 1/2" Curved Back Cushion: Seamless padded self-skinning urethane cushion, provides lateral stability. Positioning Belt, Chest: 2” wide with d-ring and hook & loop closure. Attaches at mounting screws for backrest cushion. Positioning Belt, Hip or Seatbelt: 2” wide with d-ring and hook & loop closure. 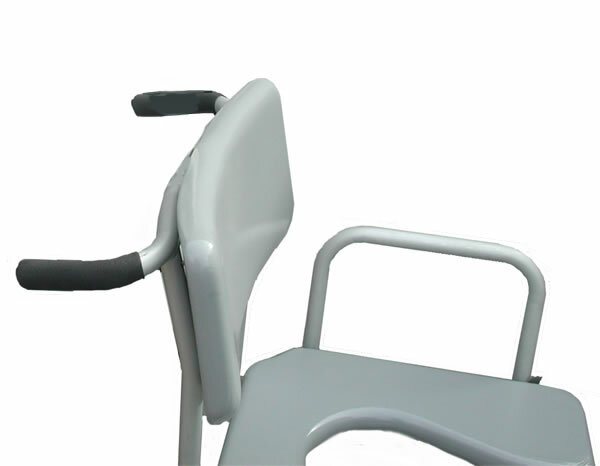 Attaches to backrest tubing. The basic warranty is a 30 day trial period with a 20% restocking fee, and a one year repair or replace policy.